have the pattern and if anyone could help identify the pattern for me, that would be very helpful. 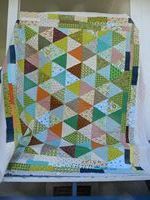 These are 60 degree triangles sewn together . Could simply be 1,000 Pyramids since they are all random fabrics and pairings. To me, they look like kites. It appears that one triangle is a 90 degree triangle and one is a 60 degree triangle. But I can't think of the pattern that uses them. If you are unable to come up with one, perhaps you could trim each set to an HST size that you could put together in any of dozens of ways. Thankyou ladies for all the suggestions. Once again you ladies have come thru with your expertise, and I thank you for sharing. that's going to be so cute! Please post a photo when done! This is going to be an awsome quilt! Reminds me of ice cream cones!! I too thought that one triangle was a tad larger than the other. I now think that it was the camera angle that made them look that way. these could be easily arranged to form hexagons... Of course, I've been dreaming in hexagons lately... they seem to be taking over the world! This could be the centers or stars for the periwinkle or snowball or Arkansas Star quilt. Here is a pic of the quilt in its' sandwich stage, ready for topstitching. Not Thousand Pyramids. These blocks look like kites, the pyramid is equal on all three sides. EDIT: I take that back, after seeing the full qult is is A Thousand Pyramids. Funny how the piecies looked like kites.Maybe they are for a different quilt or a border. Last edited by ube quilting; 07-22-2013 at 02:47 PM. They also look a bit like the ice cream cones that are the sashing settings on some dresden plate quilts.